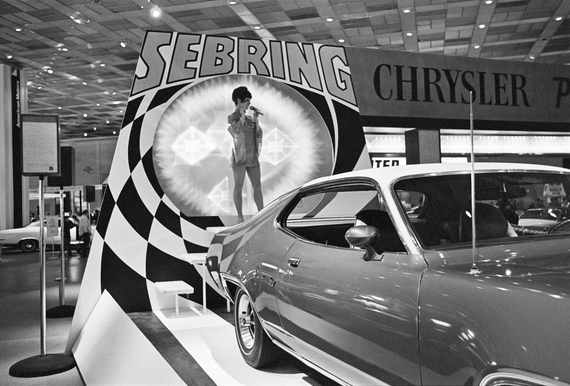 Later this month, thousands will attend the North American International Auto Show in Detroit, Michigan; however, the other must see auto show is the Bill Rauhauser Photography: Detroit Auto Show, 1960s – 1970s at the Hill Gallery in Birminham, Michigan. This vintage auto show is a step back in history. 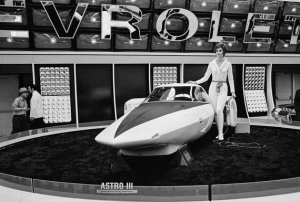 And for many it will be their first opportunity to get a flavor of what it was like to attend these classic auto shows. Long before Instagram, digital photography and Photoshop, Bill Rauhauser, 96 was capturing the images here at these auto shows and on the streets of Detroit. On New Year’s Day, Mr. Rauhauser talks candidly about the Detroit Auto Show images he photographed. “I remember it all”, he says as he is looking through the prints. “I would get there early and go by myself. There was no cropping (of the prints),” he recalls. Rauhauser is passionate about his upcoming exhibit. He is working closely with gallery owner, Timothy Hill. “Bill is interested in seeing these images on a large scale. He wants to give people a grand sense of what it was like to walk into the auto show in the sixties and seventies,” adds Mr.
Mr. Rauhauser has spent seven decades on the streets of Detroit capturing the things that most see, but few pay attention to, and even fewer understand. He followed what he refers to as the three iron laws of street photography. The first law is to Being There. In other words, one does need to literally be present on the streets and closely observe. The second law is Being Ready, and this has nothing to do with having your camera on the correct setting. Mr. Rauhauser is clear that the competent street photographer is educated with a strong background in history and literature. One must understand the nuances of the culture and where they are working in order to develop an appreciation of what is critical to photograph. This is what gives depth to the photograph. The third law is to be lucky. Sometimes a stranger will give you a look, smile just the right way, the light is perfect and that moment, if you are so lucky is yours to photograph. The moment will never happen again, and it cannot be planned. Initially, this artist had no plans of making photography his profession. He is self- taught, and earned an engineering degree. It was at a 1947 Henri Cartier- Bresson exhibition at New York’s Museum of Modern Art that Rauhauser made the decision to make a career out of photography. He realized that photography is a universal language, an art that all can interpret and appreciate. Then in 1951, Rauhauser was attendance at a lecture Edward Steichen was giving at the Detroit Institute of Art. It was here that Steichen discussed an upcoming exhibit Family of Man at the Museum of Modern Art. This exhibit would display common images and concerns that people could identify with in this post war era. Rauhauser had an inkling that a few of his prints would be a good fit for the theme, so he decided to send in three photographers, but heard nothing back for weeks. One of Rauhauser’s prints was accepted for the 1955 show. Unbeknownst to Rauhauser at the time that his print was selected, but this show would lead to international exposure. For eight years, this show ended up traveling the globe and more than nine million people would see his print. Mr. Rauhauser is still following his three iron laws of street photography and continues to take photographs. He plans to attend the reception for his exhibit on January 15,2015 from 6 to 8 pm. The show will run from this date until February 25, 2014.